What changes will make the 2020 Nissan Kicks different? Maybe a new color choice or two, but Nissan’s crossover-style subcompact hatchback won’t be meaningfully altered for model-year 2020. Introduced for 2018 to replace Nissan’s kooky Juke, the Kicks is a surprisingly likeable little runabout, with cheeky styling, great maneuverability, and laudable packaging. Its maker calls it “a crossover for the city,” an apt description because it’s designed like an SUV, with contrasting-color wheel arches, elevated seating, and 7 inches of ground clearance. But the Kicks isn’t a true crossover because it comes only with front-wheel drive. To be one, a vehicle like this must be available all-wheel drive (AWD), at least as an option. Still, if there is such a thing as an urban crossover, this affordable five-seater is it. The ’20 Kicks will retain one engine, three trim levels, and start just under $20,000. Expect prices to creep up over the next few years, but don’t look for major changes. And note that the ’20 Kicks will again be one of two Nissan entries in the subcompact-crossover segment. The other is the fractionally larger, slightly more expensive, and far more conservative Rogue Sport, which is available with AWD. Should I wait for the 2020 model or buy a 2019? Buy a 2019 because the 2020 will be a virtual rerun, although prices are almost certain to be marginally higher. The model lineup will carry over, with base S, midlevel SV, and top-tier SR trim levels. To Nissan’s credit, each ’20 Kicks will again come standard with autonomous emergency braking designed to stop it automatically to mitigate a frontal collision. Expect the SV and SR to again augment that with blind-spot and rear cross-traffic detection as standard. The ’20 Kicks will likely remain one of just two in its competitive set that are front-wheel-drive only; the other will again be the Toyota C-HR. In fact, chances are slim the Kicks will be available with AWD during its current design generation. The next all-new version isn’t due before model-year 2024 or so, and AWD clashes with Nissan’s plan is to keep Kicks very affordable and highly fuel-efficient. Still, folks who fancy an AWD Nissan subcompact crossover with more brio than the Rogue Sport might indeed want to pencil in model-year 2020 or ‘21. A new Juke seems to be in the works. That jiggy buggy was available with AWD and turbocharging, too, but was discontinued after model-year ’17. Recent spy photos appear to show a second-generation undergoing testing. Alas, sources say is probably won’t be offered in the U.S. market. No. The ’20 Kicks will reprise its crossover cues in combo with a menu of Nissan styling prompts, including the “V-motion” grille, boomerang headlights and taillights, and a touch the brand pioneered, the trendy blacked-out rear-pillar “floating roof” treatment. Visual distinctions between ’20 Kicks trim levels will again run to details like body-colored mirrors for the SV and black mirrors with integrated turn signals for the SR. The SR will also return with fog lamps, a dark-tinted grille, LED headlights, and body-color bumper inserts. The S should be back with 16-inch wheels with steel wheel covers and the SV and SR with 17-inch alloys. All models should again come with roof rails, and the rear spoiler that’s standard on the SR should return a stand-alone option for the other models (it cost $360 for 2019). Given the youthful target audience, Nissan wisely offers opportunities aplenty for individualization. Expect the ’20 SV and SR models to again be available with fashionable contrasting-roof schemes. For 2019 they cost $200 and were black roof/white, orange, or red body; orange roof/grey body; and white roof/blue body. Other accessories should again include interior and exterior lighting packages, including one that adds external ground lighting – perfect for cruising the club district. Inside, the ’20 Kicks will retain a sporty, youthful air, with a flat-bottom steering wheel (leather-wrapped on the SR) and a dashboard that balances sculpted contours and a simple control layout. Every trim level will again come with a 7-inch central dashboard screen that serves primarily as a connectivity interface. 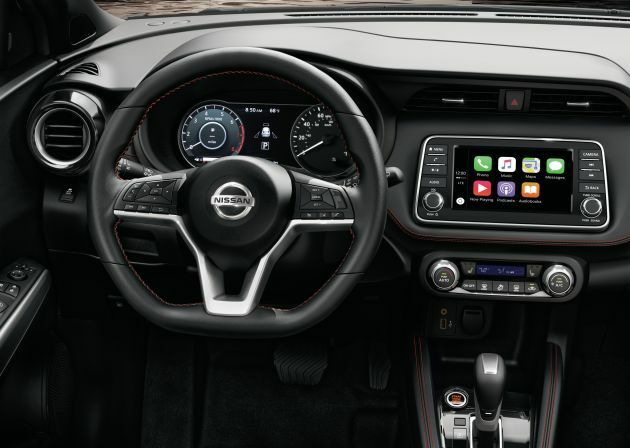 Don’t expect Nissan to add imbedded navigation for 2020, but Bluetooth and Siri Eyes Free should return as standard, although Apple CarPlay and Android Auto probably will remain exclusive to the SV and SR. Those models will also keep a partially digital instrument cluster that allows for some customization, although oddly, won’t display a digital speed readout. Hard plastics will remain in abundance, but overall, cabin materials will come across more upscale than prices might suggest. Nothing feels hollow to the touch. Standard again will be neat quilted cloth upholstery, upgradable on SR models with Nissan’s impressively executed Prima-Tex, a faux leather also applied to portions of the instrument panel. The front bucket seats deserve special mention. Their bolstered shape and dense foam padding furnish support usually found in far more expensive vehicles. The fold down driver’s seat armrest is a thoughtful perk, too. Despite its subcompact dimensions, Kicks doesn’t skimp on rear passenger accommodations. The back doors open exceptionally wide and the sofa-height bench promotes a comfortably upright posture with great sightlines and plenty of foot and knee room. There’s no rear center armrest, though. Cargo volume is at the upper end of the class, with 25 cubic feet behind the rear seat and 53 with its 60/40 split sections folded. Nothing’s anticipated, so the 2020 Kicks will again excel for driving manners around town but fall victim to its modest power on the open road. Despite its crossover aspirations, the Kicks is based on Nissan’s entry-level subcompact Versa sedan Versa Note hatchback. It shares their front-wheel drive substructure, as well as budget-grade components, such as rear drum brakes and a torsion-beam rear suspension. Still, some astute tuning gives the Kicks a lively character — within its limits. It answers quickly to rewardingly firm steering and feels nimble on city streets and suburban boulevards. The ride is taut enough to erase sloppy motions in turns or on uneven pavement while cushioning harsh impacts from bumps and ruts. Too bad you can’t exploit these assets when speeds increase and cosmopolitan confines give way to twisty byways and challenging highway onramps. Blame the powertrain. The ’20 Kicks will return with just one engine, a 1.6-liter four-cylinder with 125 horsepower and 116 pound-feet of torque. That output is low even for this segment, especially in torque, the key to acceleration. Of little assistance is the sole transmission, a continuously variable automatic capable of adequate throttle response at low and moderate speeds but left with negligible torque to deliver above that. With scant muscle to pull you through fast curves or to pass with authority, the otherwise entertaining Kicks lives down to its urban-crossover capabilities. Not likely. At least that underachieving powertrain contributes to EPA ratings that lead the competitive set. Expect the 2020 Kicks to repeat its 2019 ratings, at 31/36/33 mpg city/highway/combined. 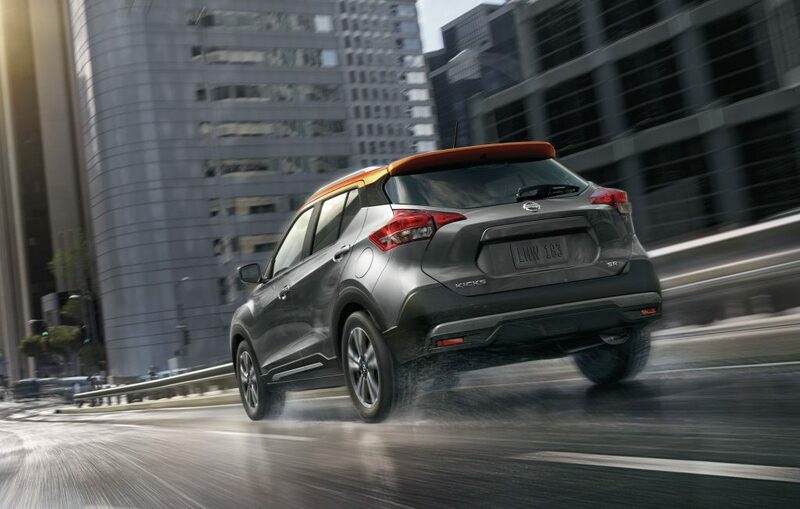 That’s tops for front-wheel-drive subcompact crossovers. The 2019 Kicks is offered in a range of seven exterior colors  plus five two-tone combinations. Three of the two-tone color schemes utilize a black roof and contrasting body colors (white, orange or red), along with one each orange roof/grey body and white roof/blue body. Doubtful; with the aforementioned driver assists as standard, the 2020 Kicks will again cover the safety basics nicely. We’d like to see blind-spot and rear cross-traffic detection migrated from the SV and SR to the S, but that would likely inflate its price above the $20,000 threshhold so valuable to advertising and Internet searches. Expect standard equipment on every ’20 Kicks to again include Bluetooth connectivity, three USB ports, iPod compatibility, keyless entry with pushbutton start, and automatic on-off headlights. In addition to the features already noted, expect the ’20 Kicks SV to also include perimeter unlocking, heated mirrors, a cargo tonneau cover, automatic climate control, satellite radio, remote engine start, and Nissan’s useful Easy Fill Tire Alert that toots the horn to signal proper inflation when you’re at the air pump. To all that, plus its exterior and interior enhancements, the ’20 Kicks SR should again add the automaker’s Intelligent Around View Monitor, which projects on the dash screen a helpful 360-degree birds-eye view of the vehicle. In addition to accessories such as the ambient lighting, the ‘20 SV and SR should again be available with black 17-inch alloy wheels (they cost $495 for 2019). Nissan is apt to again offer but one major option group, the SR Premium Package. Priced at $1,000 for 2019, this included the Prima-Tex upholstery, heated front seats, and a security system. It also contained upgraded audio with the Bose Personal Plus sound system. This installs a pair of lightweight 2.5-inch speakers in the driver’s headrest to focus the sound, but in our tests, it didn’t effectively boost the listening experience. How will 2020 prices be different? Estimated base prices here include the manufacturer’s destination fee, which was $995 on the 2019 Kicks. For ’19, Nissan increased its destination fee $20 and raised base prices a net $480 on the Kicks S, $580 on the SV, and $700 for the SR. 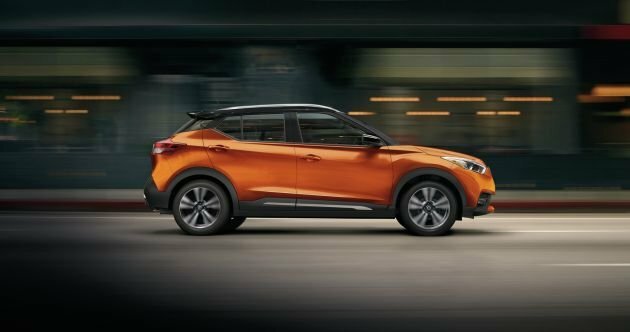 Given that, figure model-year-2020 starting prices of around $19,990 for the S, $21,750 for the SV, and $22,500 for the SR.
Look for a 2020 Nissan Kicks release date during the third quarter of 2019. Chevrolet Trax, Fiat 500X, Ford EcoSport, Honda HR-V, Hyundai Kona, Jeep Renegade, Mazda CX-3 and CX-30, Mini Countryman, Nissan Rogue Sport, Subaru Crosstrek, Toyota C-HR.